Five or six years ago, while living in Montreal I went to an art exhibition that blew me away. 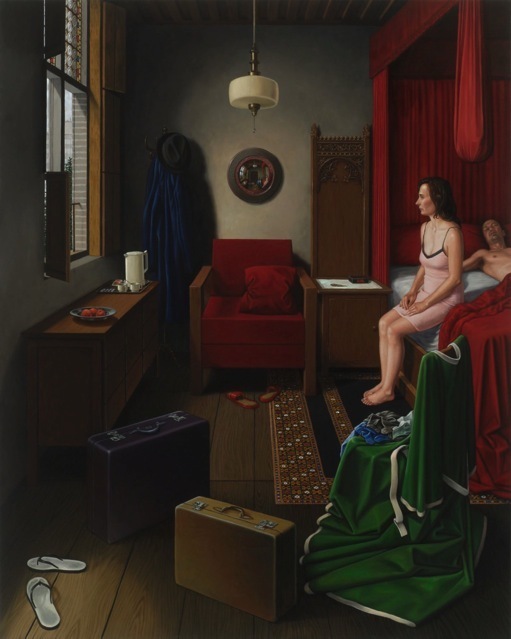 The artist was Mark Lang. I love appropriation as a form of art and Lang has to be one of the greatest in the field. Check out his appropriation of Jan Van Eyck’s Les époux Arnolfini. Notice the adaptations of Lang. It is quite the analogy and really, have things changed that much over time? Not really, it seems. Perhaps that’s why so many of us find comfort in the warmth of older houses and decors. Let others show you art! Posted on June 27, 2013 by sheepinabasket	• This entry was posted in Daily prompt and tagged Art, Daily prompt, Jan van Eyck, Mark Lang. Bookmark the permalink. Love this, thank you for posting it! Glad you like it. I just love his art! And if I’m not mistaking, he and his wife are the subjects of the painting. He does that! I imagine marriage to be like the first painting. So true! I’d be curious to see what Lang painted in the mirror on the wall! All of his work his amazing and when standing in front of one of his pieces – which are often huge btw – time stops. Thanks for visiting! Very cool post! 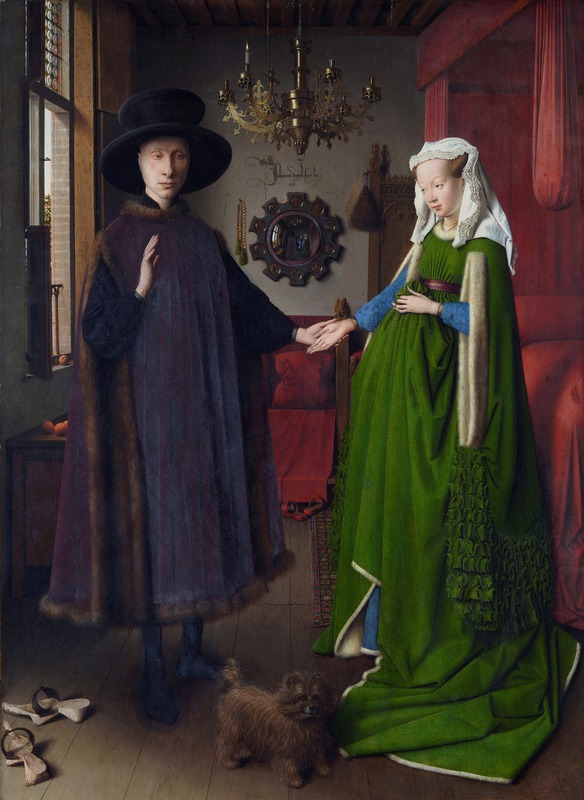 I’m not familiar with appropriation, but I have a good eye (or did) and can see all the little subtleties Lang pulled from the famous van Eyck painting. The colors hit me instantly, but did you notice that mirror (and 500 other things)? Those convex mirrors have a name that’s escaping me now! They were very popular in their time. I have another degree in interior design (did that after I got sick as I have a talent in it, but to no avail work-wise due to EDS) and my brother is an artist in LA who shows there and abroad. I do not have that talent at all, but I have the eye! If I weren’t sick and had his talent, I’d be a textile designer (love textiles!). I keep quiet about my brother as he’s in the Hollywood crowd due to his style (yuck). You know, I was in Vancouver once and there was a Frida Kahlo exhibit at the museum downtown.. She’s my favorite so I was quite excited! There was always great culture in the Canada I knew. Your brother – wow – now I’m really curious! I’m just swallowed by exhibits – get what you say about Frida Kahlo. I tend to be an old master’s type of person for some reason and anything that takes me back there makes me happy. That’s probably why I like Lang so much – but then he uses everything – appropriates it. Someone told me once that “appropriation” was not permitted and if you read about it there’s a lot of confusion. I LOVE appropriation and it’s somewhat like giving credit to someone who had an influence on us. Interior design? I’d love that – and I’m also very drawn to textiles! I like how you describe Lang and I think his work is very interesting, as well (I went to the link). I’m more of a traditionalist in my design, like you with art. Well, eclectic I suppose. I lean towards vintage and strong colors, but no specific period and do pull from the French and Spanish a lot–at least in furniture lines. I can’t stand going into a room that came right from X store and is so generic and tells me nothing about the person. My brother is quite the story. We have a huge age gap and I used to take him to the galleries in Seattle when they were open late once a month when he was in middle school. His art comes from the street, but he has a formal ed. in graphic design. He’s meticulous and his art (mixed media) is very unique and makes you think, but it’s very hip, hence the Hollywood crowd he swore he’d never get involved with. His murals are all over LA (commissioned, so no more jail time like in his youth!). Maybe I can sneak something in as he usually goes by a different name (and is in a collective with a fellow artist), but he’s all over the internet and I don’t want him tied to my blog–even though he created it (probably in 5 seconds). Lol. I saw that you had that and I ran into a blogger (crazy person!) who had the same but it all went via e-mail after the 1st comment and I don’t have a public address, so a bit of a nightmare. I could care less if you knew my full name, but I get too worried with this litigious society is the US and docs who might try to sue me, even though I try to stay pretty anonymous. I’ve heard some horror stories. Just a US thing. I’ll remember you have that if I can ever figure it out, but Outlook pulls my name even on Gmail accounts. Argh! I’ll see if I can find something of my brother’s to put in my comments that’s anonymous, but off to bed now. Worse day ever–may write on it, but have a draft going now. Good day/night… Had fun with the art tonight! I needed something good and that Kelly green is still in my mind. I wanted to do a little design blog but you can’t copy any images! It’s all pining on Pinterest now (boring). Everyone has talent. And honestly, I don’t think mine is that great. It’s just that I over analyze everything and keep adding coats and coats. A lot of my work is sitting there waiting for me to finish! It is good! You sound like me with design, which is why I could never do it for money even if I were well. I over-analyze everything. Perfectionistic personality. It’s funny isn’t it? Or maybe it’s not funny being such perfectionists that it keeps us out of the picture when we should really be out there. Same here… Just larger SW city. Boy, am I blowing up your comments! I did do some design work (and interned at a fabric showroom to the trade), but no one has any money or taste and it’s too much with my perfectionist problem. I’d hoped to make a small business I could have with my sick body, but it just didn’t work. You should try to show your work! Even in a cafe if need be. I still dream about textiles and color palettes. If I could find anything here (and see/get out), I’d try to have an online shop on Etsy, if you’ve been to that site (where I got my blog’s background that my brother thought of doing–vintage, anatomical eye chart). The chart is the image in my 1st post. Very cool stuff on there. Been on Etsy many times mainly to look up other painters’ stuff. But honestly, I’m not productive at all. Don’t know what’s wrong with me. Good night… I always enjoy our marathon comment sessions, as well! How very creative! Never thought of a more modern adaptation of a classic. I guess that’s why I am not an artist!!! 🙂 Thanks for sharing. Thank you, Charlotte. 🙂 How are you?